If you�ve already started looking for your guinea pig, the number of breed variants can be perplexing. The guinea pig is often referred to as a cavy, deriving from the Latin�Cavia porcellus. 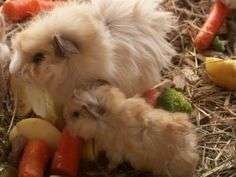 Since then, their popularity hasn�t waned � they have been crossbred to produce many different guinea pig types, particularly the colour and consistency of their hair. Affectionate � they can develop attachments to their owners. Dalmatian � White with black spots, like the dog. Bicolor � 2 colors � Can be any color combination exception black or red, which is tortoiseshell. Dutch � White with one other color. The white is found on the face, chest and around the shoulders, like a harness.